The district situated on the south west coast of India. It extends latitude 9o28' and longitude 76o17' north. The district is bounded on the north by the Alappuzha district, north east by the Pattanamthitta district, east by Thirunelveli district of Tamilnadu, south by Thiruvananthapuram district and west by the Arabian sea. The area of district is 2491 sq kms and in area the district ranks seventh in the state. Two rivers, Kallada and Ithikkara, flow through this district. The Sasthankotta lake, the only fresh water lake in the state, is here. Two other major lakes are the Astamudi kayal and the Paravoor kayal, Edava and Nadayara kayals lie partly in this district. The district has a tropical humid climate, with an oppressive summer and plentiful seasonal rainfall. The hot season, lasting from March to May, is followed by the south west monsoon from June to September. The northeast monsoon occurs from October to November. The rest of the year is generally dry. The area under forest in Kollam district is 1100 sq. kms and it falls in Thenmala, Punalur and a portion of Achencoil forest division. Thenmala range, Aryankavu range and shendurney Sanctuary constitue the Thenmala division. 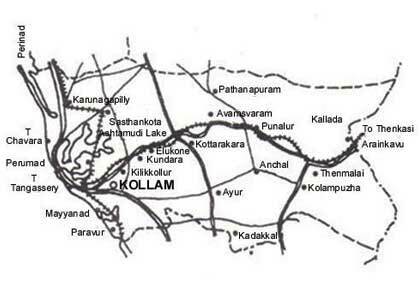 Achancoil range, Kalla range and Kanayar range, make up the Achancoil division while Puanlur division includes Pathanapuram and Anchal ranges. Teak and softwood from the major forest plantations in the district. The district is immensely rich in mineral resources. The beach sands of the district have concentrations of heavy minerals like Ilmenite, Rutile, Monosite and Zircon which offer scope of exploitation for industrial purpose. Besides, large deposits of China clay in Kundara, Mulavana and Chathannoor, there are also lime shell deposits in Asthamudi lake, Bauxite deposits Adichanallur and desseminated graphite in Punalur.